The RP Photonics Buyer's Guide contains 6 suppliers for photo cameras. Photo cameras are a type of cameras used for photography, i.e., for taking still images – although some photo cameras also have some video functionality (see below). Usually, they work with visible light, but they can also have some sensitivity particularly for near infrared light. See the articles on cameras and on imaging with a lens for some basic aspects of imaging devices and for other types of cameras. Traditional photo cameras used photographic films – originally monochrome films, later on improved versions for color photography, involving more sophisticated chemistry. Although they have been largely replaced with digital cameras (see below), film-based cameras are still used for some purposes. The inserted film role presents a limited number (e.g. 24) of opportunities for capturing an image. Before viewing, the film has to be developed to produce negatives with inverted brightness – typically, in some professional laboratory, rarely by the photographer. From those negatives, the actual images are produced; one can produce multiple images per negative image. The resulting images are delivered on a kind of paper and can have different formats from rather small to poster-size formats. There is a photographic objective, through which the light from the observed scene enters the operators. Behind the objective, there is an optical aperture of variable opening. Next, there is a shutter, which can be briefly opened when a photograph is taken. Behind the shutter, there is the piece of photographic film to be used. In addition, there can be some optics for a viewfinder, which can either be separate from the actual camera optics or (in single lens reflex cameras, see below) use the same objective. In recent years, photo cameras have been more and more equipped with electronic image sensors, normally of CCD or CMOS type, producing digital images. Typically, the used image sensors have a similar size as the previously used pieces of photographic film. In most cases, they offer at least a few million pixels, and even cameras with tens of megapixels (million pixels) are available. For each pixel, information concerning the intensity of red, green and blue light is stored (RGB coding). 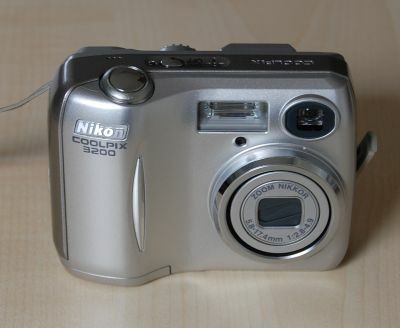 Figure 1: A compact consumer-type digital camera. The images are available immediately, without time-consuming development processes involving extra cost. They can be stored, copied, published on web pages and in other electronic documents, etc. Due to the large storage capacity which can easily be integrated even into cheap consumer-type cameras, large numbers of images can be taken in a sequence without changing a film. Non-successful recordings can be easily deleted in order not to waste any storage capacity. Where full resolution is not required, image capturing with reduced resolution can further increase the number of images which can be stored. Electronic images can be quickly transmitted, often even from remote locations. For example, a newspaper may rapidly obtain images from reporters at remote locations. Images can be processed on a computer before printing or web publishing. Although traditional film development also has some potential for modifying images, digital image editing provides for more extensive opportunities. On the other hand, this also provides extensive opportunities for forgery, which may be difficult to detect. Digital images are not subject to aging, while old film-based photographs often exhibit substantial changes of color and other loss of quality. Early digital cameras were quite limited in terms of image resolution, but cameras with higher resolution image sensors soon became available and affordable. Only for special applications, the resolution of modern consumer-grade cameras is insufficient, and professional devices can provide even higher resolution. Note that an increased sensor resolution is useful only if the optical quality of the photographic objective is sufficiently high; otherwise, more image pixels do not really convey additional information on the objects. One then only produces unnecessarily large image files, and the quality may become even lower for low light level conditions, since the amount of light received per pixel is reduced. Note that this is the case in some consumer cameras, where buyers are impressed with huge megapixel values but later possibly disappointed by modest image quality. Figure 2: A tele zoom objective for an SLM camera. A standard objective is suitable for most ordinary situations of photography, covering a substantial range of distances. Its field of view is roughly 50 deg;, comparable to that of the human eye. There are tele objectives for large distances, having a large focal length for a narrower field of view. About the opposite thing are macro objectives, suitable for taking images of small objects from very small distances. There are also wide angle objectives, in extreme cases called fish eye; they can capture images from white angular ranges that tend to produce substantial geometric image distortions. Some objectives are zoom objectives, which means that their focal length can be adjusted in a certain range, usually without affecting the focusing. The used mounting mechanisms for objectives partially allow the use of objectives from other manufacturers – in some cases, requiring suitable mechanical adapters. Difficulties can arise when electrical connections are also needed, for example for autofocus functions. Photographic objectives can differ substantially in certain respects, for example concerning the light gathering power, zoom range and image quality. 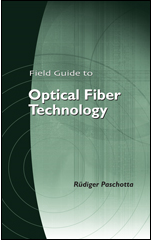 Sometimes, the characteristics of an objective can be modified by inserting an additional optical element. For example, there are macro lenses to be combined with standard objectives so as to obtain a macro objective. As explained in the article on imaging with a lens, the imaging system needs to be adjusted to a certain object distance in order to get sharp images. For some types of cameras, such a focus adjustment is not necessary, since they have a fixed focus, e.g. set to infinity or to some fixed working distance. For most photo cameras, this is not sufficient, however; one needs at least the option of manual focus adjustments (usually by rotating a part of the objective) in order to use the camera for a wide range of object distances. Many modern cameras even have an autofocus function which does that adjustment automatically; typically, it uses properties of taken images for that purpose, or alternatively a separate distance sensor. Autofocus technology may be integrated into the camera body, or sometimes in photo objectives. It is essential for the photographer to see in advance what area exactly will appear on a photograph. Simple cameras fulfill that purpose with a small separate optical viewfinder slightly above or on the side of the photographic objective, not using light which comes through the objective. That approach has severe disadvantages, however: the slightly different perspective results in a somewhat inaccurate result, and the method could hardly work with exchangeable objectives, having different fields of view, and with zoom objectives. 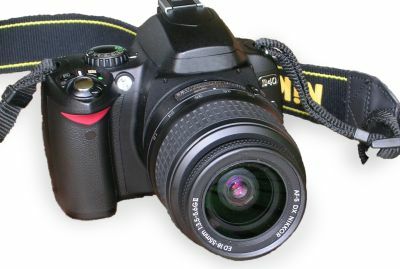 Figure 3: A single lens reflex camera. Therefore, reflex cameras have been developed, where one uses light coming through the objective. A typical type of camera uses a mirror, which at most time directs the received light to the visual output, allowing the photographer to see through the objective. Using a pentaprism, an upright image is obtained. Only in the moment where an image is taken, that mirror is folded away, letting the light get to the film or to an electronic image sensor. Alternatively, one could in principle use a beam splitter, but that would cause a loss of brightness for both the image taking and the viewfinder. The reflex camera principle works well with variable objectives and zoom objectives, always showing precisely what will get to the image sensor. Because only a single lens (strictly speaking, a single objective and no additional viewfinder objective) is needed, such cameras are called single-lens reflex cameras (SLR cameras). The viewfinder can of course also be used for checking the adjustment of zoom and focusing. A possible alternative to the SLR principle, which allows for lower fabrication costs, is the use of a liquid crystal display (LCD) as a full replacement for the optical viewfinder. This method has some disadvantages, however; for example, it can be difficult to accurately read the display under conditions of bright ambient light, and one can then not use the display simultaneously for displaying a larger number of operation parameters. Consumer-level digital reflex cameras with exchangeable objectives typically use substantially smaller image sensors. For example, the format can be 23.6 mm × 15.7 mm or only 13.2 mm × 8.8 mm; there are various other formats used in common cameras. There are large format film or (rarely) digital cameras with image formats of 4 × 5 inches or larger. Highly compact mobile cameras (see below) need to work with very small sensors, e.g. only 1/4 inch (6.35 mm) wide. Nevertheless, a high image resolution with multiple megapixels is possible when using sensor chips with a very small pixel spacing of only a few microns. The used electronic image sensors are often smaller than the corresponding film! As mentioned above, many digital cameras use electronic image sensors with a size which is significantly smaller than the size of a piece of film, used as a reference format. The so-called crop factor (CF, typically between 1.3 and 2) tells by which amount the diagonal of the image sensor is reduced compared with that of the reference. A large crop factor implies a reduced field of view for a given objective. The obtained field of view is equivalent to that of a camera with a full size sensor (CF = 1) and a focal length which is increased according to the actual crop factor. That issue needs to be taken into account when deciding on a focal length for a certain photographic situation. The aperture and ISO settings also need to be adjusted accordingly. Confusion can arise from the fact that some manufacturers have specified a kind of effective focal length values, increased over the actual values by the crop factor, but partly without making that clear. A large crop factor can be interpreted as providing a larger magnification, in the sense that a given number of pixels is associated with a smaller angle of view. However, this is of course no real magnification by the optics, and a larger sensor with the same pixel spacing would give the same spatial resolution. Under given conditions a smaller image sensor will overall collect less light. It will thus require an accordingly longer exposure time, or otherwise produces images with higher noise, unless the sensitivity of the device can be improved in other ways. Therefore, photo cameras with full-size sensor (CF = 1) tend to be better suited for photography under low light conditions. When a smaller image sensor is used, one may also use an objective which is not optimized for the unused part of the area. It may therefore be produced at lower cost and be comparatively lightweight. Highly compact miniature cameras have been developed which can be used in many mobile devices such as smartphones and tablets. They are limited to the use of microoptic devices, e.g. single-lens objectives without zoom, which also usually need to be fabricated at very low cost. A surprisingly good image quality can nevertheless be achieved, for example by using aspheric plastic optics and some improvements with numerical image processing. However, such cameras tend to have serious limitations for example under poor lighting conditions. As a replacement for an optical zoom, they sometimes offer a digital zoom. That, however, effectively reduces the available number of pixels. It is not better than later on using only part of the taken image, possibly scaling it to a larger number of pixels with interpolation. Whether a photographic film or a digital center is used, one always requires a certain minimum amount of light to produce a high quality image. Under poor light conditions, one may thus have to lengthen the image capturing time (exposure time). This can in turn lead to blurred images when the objects or the camera is moved during the exposure. At least movements of the camera may be minimized, e.g. by using a tripod. In some cases, blurring effects resulting from long exposure times are intentionally used, for example for artistic purposes. Typical exposure times in photography are small fractions of a second, e.g. 1/125 s. However, one may also make long exposures over seconds, minutes or even hours, for example of the night sky, showing the apparent movement of stars. Many modern cameras allow for automatic exposure control based on the signal from a built-in photometer. The higher the measured brightness, the shorter is the used exposure time. That is very helpful and not only convenient; it would be very hard to judge with the eye the actual brightness level, because the eye automatically adapts to ambient light conditions. Particularly for image sensors with limited dynamic range, such features can be very important. In photography, the aperture size is often indirectly quantified with the f-number. Here, f/N means that the aperture diameter is the focal length f divided by N; N is the f-number (or f-stop number or focal ratio). This means that a large f-number corresponds to a small aperture and vice versa for a fixed focal length. Typically used f-numbers are 2.8, 4, 5.6, 8, 11 and 16, progressing roughly such that each step (“going up one stop”) reduces the aperture area and therefore the light throughput by a factor of 2. Using a large optical aperture in the camera, one can get more light to the sensor and therefore use a shorter exposure time. However, this also reduces the depth of field – particularly for objectives with long focal length. (This is also explained in the article on imaging with a lens.) That blurring effect is actually often even welcome in photography, e.g. when making portrait photographs with a somewhat blurred background. In other cases, the blurring can be detrimental. For photography under bright light conditions, one may use very small apertures. However, for very small apertures the image resolution could be degraded due to diffraction effects. 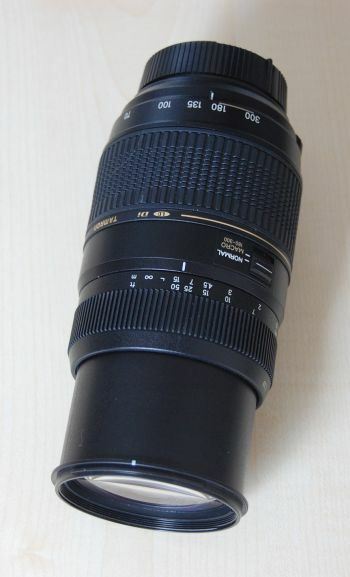 For example, for a 20-mm lens and a high f-number of 22, the aperture diameter is 20 mm / 22 &approx; 0.9 mm. That aperture will limit the angular resolution to &approx;0.68 mrad. For comparison, with a 20 mm wide sensor having 2000 pixels in the horizontal direction, the angular field of view will be 927 mrad, or &approx;0.46 mrad per pixel. In this situation, diffraction already degrades the image resolution significantly. Therefore, one may prefer to somewhat reuse the f-number and use a shorter exposure time, if possible. Obviously, such issues become more severe for image sensors with extremely high pixel resolution. The resolution may then be fully usable only when using large apertures, and provided that the quality of the optical system is very high. There are photographic films with particularly high sensitivity (high ISO values), which however tend to have a lower spatial resolution. Standard ISO values are 100 and 200; 400 would indicate a relatively sensitive film. Note that the camera electronics should “know” what kind of film is used in order to appropriately adjust parameters like the exposure time. Electronic image sensors offer sensitivities which are often quite similar to those of typical films. They also quantified with ISO numbers. Sensors can often be used in a high-sensitivity mode with additional electronic amplification. However, detector noise can have an increased influence, reducing the quality of the taken image. Therefore, it is often better to somehow provide the sensor with more light. Depending on the chosen perspective, but also on the type of photographic objective, there can be more or less serious image distortions. For example, straight edges of objects appear curved on the recorded images. Such effects are particularly pronounced for wide angle objectives, where a complete compensation is hardly possible even with complex optics designs. For digital imaging, such effects may be compensated afterwards, using suitable image editing software. The possibility of automatic adjustment of the exposure time has already been mentioned above. In addition, modern cameras have operation modes where other parameters are also automatically adjusted. For example, the apertures size may also be adapted, because the exposure time alone may be insufficient for low light level conditions. A fundamental problem with such automatic controls is that the device cannot “know” what is the optimal trade-off in the concrete situation. To some extent, this can be mitigated by using different operation modes, indicating priorities of the user. For example, there can be a sports mode, where exposure times are kept as short as possible in order to properly capture images of moving players, for example – even if one then requires large apertures, causing a reduced depth of field. There are also operation modes where the user may decide for a certain aperture size or for a fixed exposure time, and the camera electronics will adjust only the remaining free parameters. Generally, such automatic controls can very much simplify the use of photo cameras, allowing the generation of images of reasonable quality without lengthy training, simply using such automatic “point-and-shoot cameras”. Expert photographers are not always satisfied with the results obtained in that way. They may utilize operation modes with reduced automatic functions, based on a clear understanding of the importance of certain device parameters under certain conditions. Some digital photo cameras also allow video recording, but usually only to a limited extent. In various disciplines, they cannot compete with dedicated video cameras, although they are typically better in terms of image resolution and quality. For example, they often have a more limited storage capacity. Also, the handling is in some respects less convenient than that of a video camera.